I am a sucker for old schools converted into condos. Student desks retooled into entryway tables. Card catalogs being turned into innovative home storage systems -- my Mom has one of these for all her sewing supplies and it looks oh so chic. If you are like me, and love old-school (ha!) furniture and decor, or if you are just interested in browsing, head over to City Hall East on Ponce starting today at 10AM through Saturday. 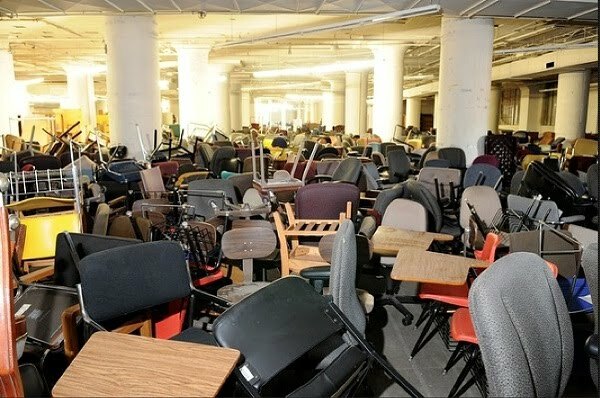 The City of Atlanta is selling off all the items in the building to prep if for turnover to private developers. This has always been one of my favorite local historic-turned-functional buildings around town, and so I am really interested to see what they have to sell off. Too bad they aren't letting us explore the historic building! 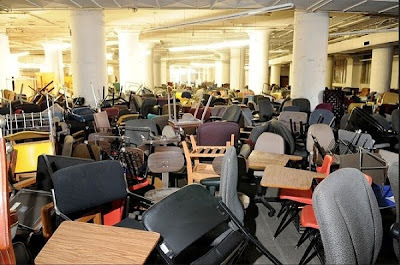 But while I am not in need of one of the hundreds of office chairs or filing cabinets, I bet there are some great (and cheap) treasures buried in that huge room somewhere, and I will def be heading over to check it out.